As I learned this week, thanks to the intrepid research assistance of friends and family, true Cracker Jack — whether you buy it at the ball park or make it at home to eat while cheering for your team — contains molasses. And while I’m always looking for ways to add iron-rich molasses to our vegetarian diet, I don’t love its flavor, which can dominate a dish. Especially a dish consisting primarily of popcorn. 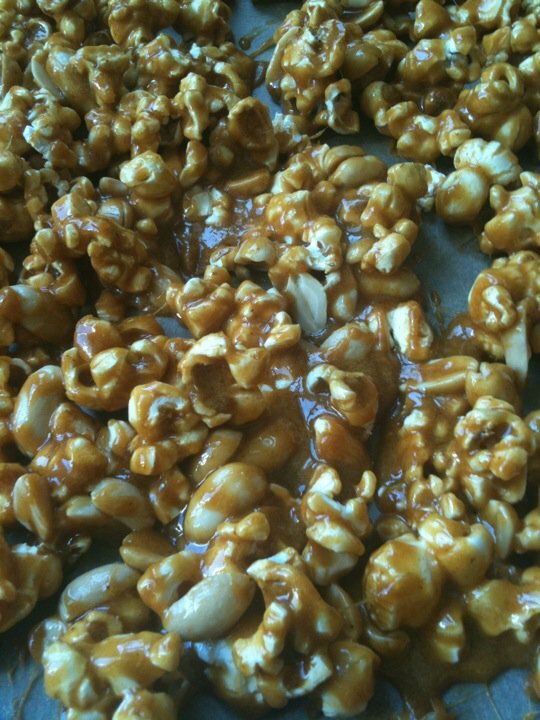 So, we made caramel corn and it was fabulous. I looked at over a dozen recipes and made two different versions, and based on all that, think this recipe from Smitten Kitchen wins. Many recipes call for corn syrup or Lyle’s Golden Syrup, they call for shortening or margarine; while I do tend to stock those ingredients, I always have a much bigger supply of plain old butter and sugar (and butter just tastes better). Other recipes are fussier about the preparation of the caramel, too, but nothing could be easier than letting it bubble, unstirred, for ten minutes. I love the addition of cayenne pepper in this recipe, which gives the corn a nice warmth without being too spicy, but if you’re sharing this with the kids, just leave the pepper out. Or, be like me and make two batches. In a large saucepan or pot with a lid, heat the oil over medium-high heat. Add the popcorn kernels, cover and keep the saucepan moving until all of the kernels have popped, about 5 minutes. Transfer to the prepared bowl, removing any unpopped kernels. Toss with salted peanuts, if using. In a small bowl, whisk together the baking soda and cayenne pepper (if using). Have the two large baking sheets ready. In a medium saucepan, combine the sugar, butter, salt and 1/2 cup water. 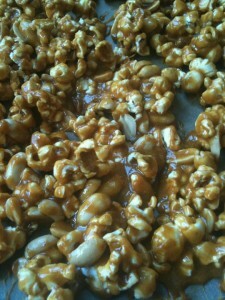 Cook over high heat, without stirring, until the mixture becomes a light golden-yellow caramel, 10 to 14 minutes. Remove from the heat and carefully whisk in the baking-soda mixture (the mixture will bubble up). Immediately pour the caramel mixture over the popcorn and don’t fuss if it doesn’t all come out of the pot — you’ll have plenty. Working quickly and carefully, use the prepared spatulas to toss the caramel and popcorn together, as if you were tossing a salad, until the popcorn is well coated. Spread the popcorn onto the baking sheets and quickly separate them into small pieces while still warm. Cool to room temperature, about 15 minutes. Once cool, store in an airtight container. This sounds really yummy and it also reminds me that Dale & Thomas’ Peanut Butter & White Chocolate DrizzleCorn, while not exactly cracker jack, is really amazing stuff. I don’t usually like white chocolate, but it works in this stuff.